Dublin City Council has presented an exciting and creative design renewing College Green as a civic space in the heart of Dublin. This new pedestrian priority space will significantly improve the quality of the city’s public realm. Designed by Dixon Jones/Paul Keogh Architects, working closely with Dublin City Council, the newly shaped College Green development will be a dramatic 7,300 sq. metre area for people to enjoy in the heart of the city centre. The attractive tree lined and granite paved space has also been designed to facilitate major public gatherings and processional events through the city. It has the capacity to accommodate up to 15,000 people and will be fully equipped with the infrastructure required to stage large public events. In order to enhance the views of the historic buildings and optimise the space for public events, the existing trees will be removed and 22 new trees will be planted. The existing Henry Grattan and Thomas Davis monuments will be restored and retained as key focal points on an axis with the gates of Trinity College. The Thomas Davis monument will be relocated slightly further west of its current position. 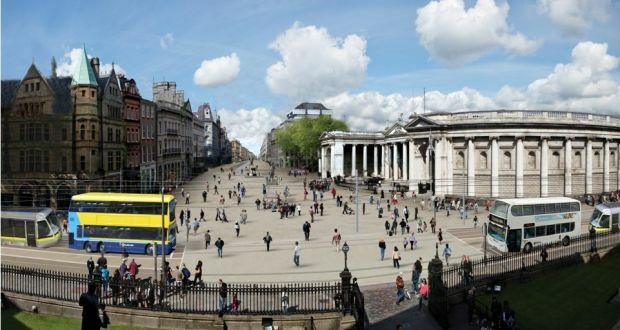 The civic space will reclaim College Green’s historic footprint from the gates of Trinity College to Anglesea Street, and will include Foster Place. There will be a defined cycle route to allow cyclists traverse the new civic space to connect with cycle lanes to the east and west of the space. An innovative and playful element of the new College Green space is an open water sculpture, with 32 individual water jets which will be controlled depending on the seasons and events taking place at College Green. As part of the design there will be a new turning circle for buses at the western approach to the space. Taxi ranks currently in the College Green area will be relocated to adjacent streets. There will be two-way traffic routes for taxis, buses and the new Luas Cross City running in a north-south direction around the front of Trinity College. Dublin City Council will submit the project to An Bord Pleanála for consideration later this month (May 2017). Subject to planning permission, construction of the College Green civic space is scheduled to commence in January 2018 following a public tender process and will take a year to complete. Dixon Jones / Paul Keogh Architects are the lead designers of a multi-disciplinary College Green team which includes Roughan & O’Donovan Consulting Engineers, Cathal Crimmins Conservation Architects, Paul Martin Landscape Designs and Rogerson Reddan Quantity Surveyors. Paul Keogh, Lead Architect, said: “With Dublin City Council, we are aiming to create ‘Dublin’s living room’ – a place that is safe, adaptable and friendly for people of all ages, both for everyday social interaction and for major public events, comparable with world-class spaces of similar scale internationally”.